Anthony from Deloitte started coming to work with our class this term. 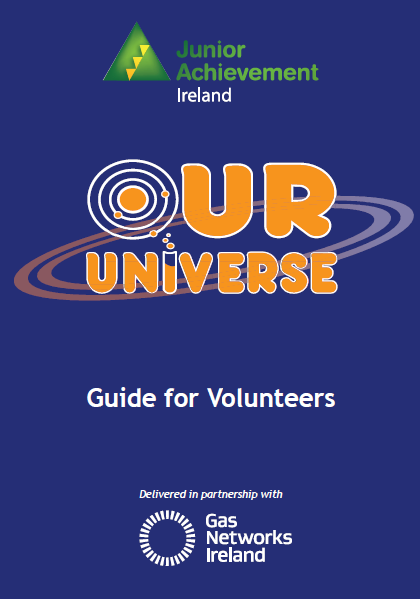 We did many science experiments in the Gas Network Ireland Our Universe programme. For the first one we learned about bones and Anthony gave us a gigantic paper human skeleton and cut-outs of names of bones and we had to match the cut-outs. The third week was about energy, we learned that there are renewable energy and non- renewable sources of energy. Some examples of renewable energy were hydro-power which was powered by water. It worked by making the water move the generator and produce electricity. Solar power is powered by the sunlight’s energy being converted to electricity. The non- renewable energies are coal and oil because it will eventually run out. For the fourth week we learned about a prescription for a healthy heart so we thought of this list. Don’t smoke, eat healthy, get at least thirty minutes of exercise and don’t eat sweets too often. We also made a poster with a slogan for a healthy heart. Our one was a pirate saying “Stay Heaarrrrrty”. I think Anthony saved best for last because this was my favourite lesson. It was about light. We were given mirrors and paper and we had to write “Reflection of Light” in a mirror. This was difficult because if you move your hand to the right on the mirror it would move left. If you looked at the writing through the mirror it would look fine but if you don’t it would look like gibberish. We also built a periscope which works by making light reflect onto another so you could see higher this is mainly used by submarines so you don’t have to leave underwater. The whole class really enjoyed all of the work we did with Anthony. Junior Achievement was loads of fun and it gave us all good ideas for different jobs that people can do when we are older.